I was originally going to write a review of The Mist next (and it’s still coming), but, given a recent bout of some emotional issues I had this week, I decided instead to do something out of left field and pick something a little more optimistic and positive – something a little more lighthearted (which The Mist is absolutely not). So, yeah, this is totally not an actual movie so much as a TV special. I don’t normally do TV shows – the closest I’ve come so far are TV movies, Batman Beyond: Return of the Joker and Ballet Shoes – but I’m making an exception for this one. It’s not so much a TV show, anyway. Let’s just call it a short film and let that be that, eh? Besides, if you were feeling as down as I was this week, you’d probably be thankful for something a little more spirited than the standard horror fair, now wouldn’t you? 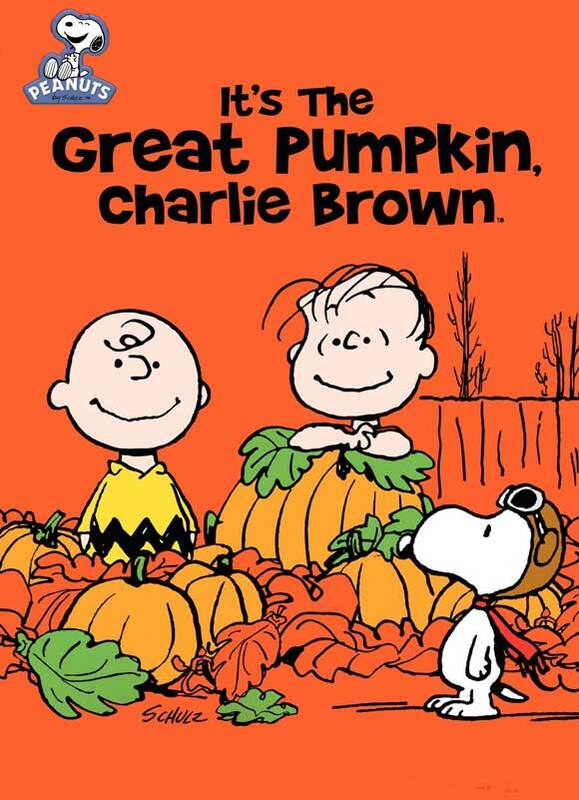 The third of what would become a long string of TV specials based on Charles Schulz’s Peanuts comic strip, It’s the Great Pumpkin, Charlie Brown has become nearly as celebrated as the first in the series, A Charlie Brown Christmas. 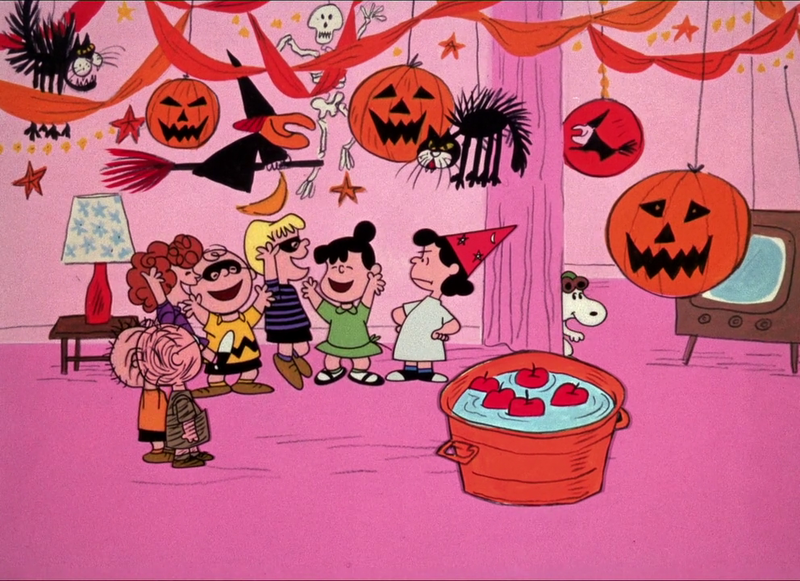 The film opens with a perfect little vignette where siblings Linus and Lucy go out to select the perfect pumpkin for their jack-o-lantern. Naïve, idealistic little Linus, who we will learn has a unique perspective of what it means to be a kid on Halloween, balks in horror at his older sister as she pulls out a knife and cruelly cuts open and guts what was once a perfectly plump, intact pumpkin. “Awww, you didn’t tell me you were going to kill it!” he sobs. 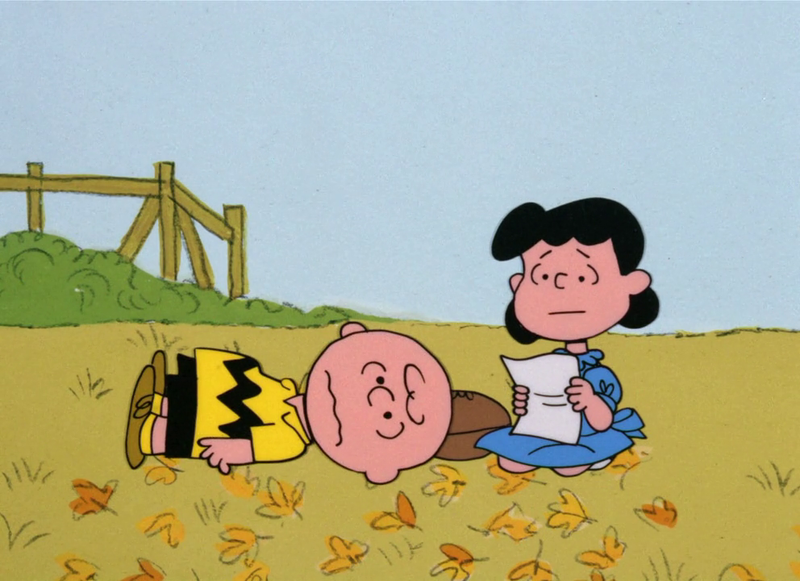 Though Charlie Brown’s name is in the title, fitfully, he’s really more of a secondary focus in his own film, as the story proper is really more about Linus and his undying faith in the Great Pumpkin, who he claims “rises up out of the pumpkin patch and flies through the air to deliver toys to all the good children everywhere” on Halloween night. The other kids predictably scoff at his unorthodox beliefs, poking fun at his letter-writing and calling him names when he takes a vigilant all-night watch over the “sincerest” pumpkin patch he’s cultivated in lieu of trick-or-treating, all in the hopes of seeing the Great Pumpkin rise up. What’s so great about the story here is that there’s an obvious but subtle commentary regarding differing belief systems – and it’s a bit appropriate that one of the more religiously contested holidays is used to illustrate this, too. 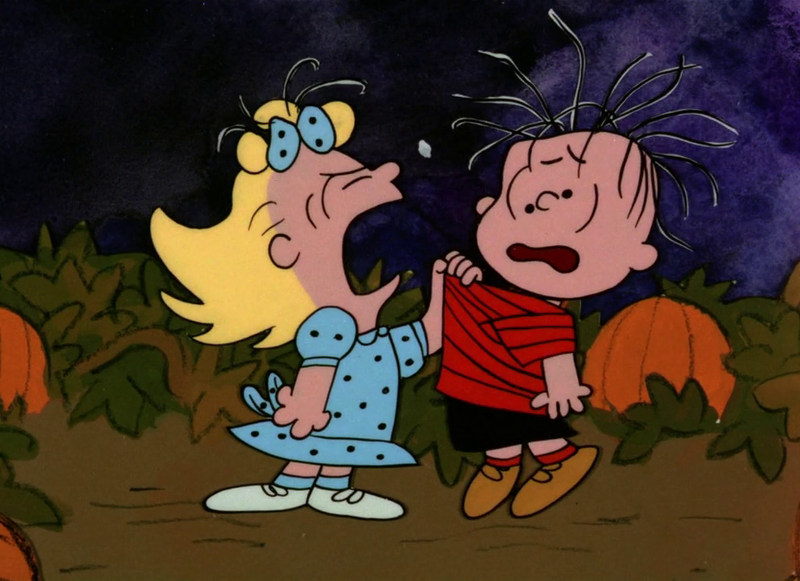 While it’s obvious to the other kids and the audience that Linus’ perspective on Halloween is certainly fringe, at best, our sympathies are obviously meant to be with Linus, who remains admirably unwavering in his beliefs, despite persecution from the other kids. It’s a great lesson that even many adults today should remember when dealing with people who do not share their beliefs, religious or not. 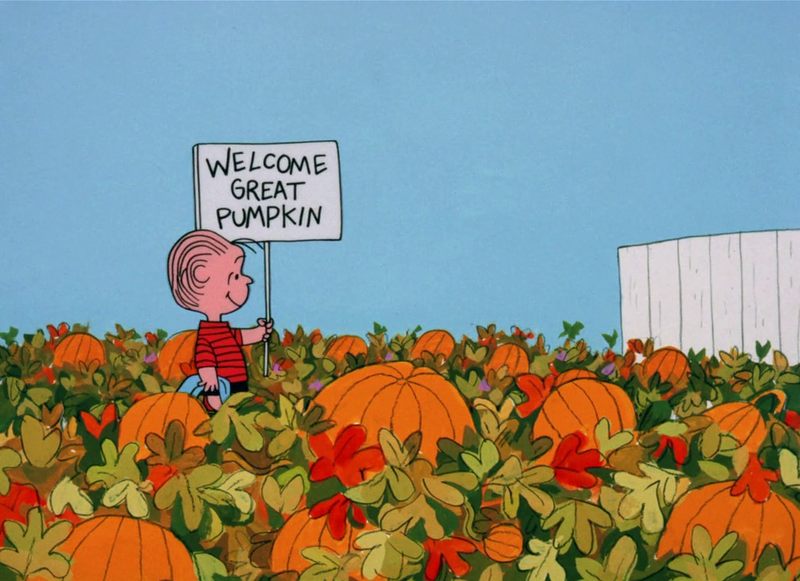 “There are three things that I’ve learned never discuss with people: religion, politics, and the Great Pumpkin,” Linus reflects. Running just 25 minutes and with a story that’s pretty simple, it’s easy to fear that the story gets bogged down in philosophical questions and commentary, but the short film never feels as if it’s beating you over the head with a message. There are plenty of other things going on to add some variety to the story, such as Charlie’s constant bad luck getting the best of him in the group’s quest for candy and Snoopy’s World War I fighter pilot costume leading to some fun and amusing pantomiming on the part of the eccentric beagle. The look of the film may seem quaint today, and the humor is more amusing than laugh-out-loud, but the charming animation and script perfectly capture the look and feel of the strip. (Hopefully the same can still be said about the CGI film announced last year 47 years after its release!) The choice to use actual child voice actors, so obviously working really hard to say their lines correctly, actually works in the film’s favor, somehow making what could have been cloyingly precocious material in the wrong hands seem so natural, relatable, and – dare I say it? –… cute. I honestly have no fault to find with the film, as I was perfectly entertained by all 25 brisk minutes of its runtime. It’s got the right amount of everything: Charlie Brown’s melancholy existence, Lucy’s brash rationalism, Snoopy’s flights of fancy, Sally’s romanticism, and, best of all, Linus’ unwavering philosophizing. I liked it as a kid and, quite honestly, I like it even more as an adult now that I understand it on a deeper level. It may not be a feature-length film, but if it were released theatrically today, there’s no doubt in my mind that it would be up for the Best Animated Short Oscar.